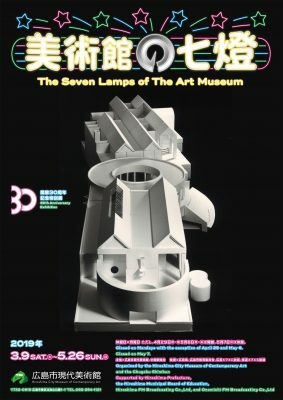 The Hiroshima City Museum of Contemporary Art was established in 1989, the first public art museum in Japan devoted exclusively to contemporary art. 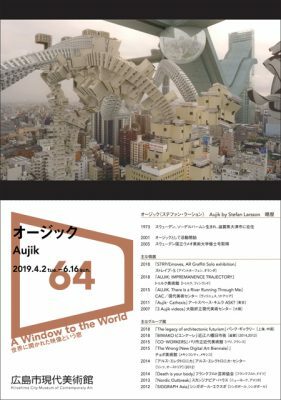 This exhibition marking its 30th anniversary primarily features works acquired for the museum’s collection thus far, and traces the arc of our activities and the museum building that serves as their foundation. With keywords as lamps that illuminate the way forward, we look back on our path thus far and re-examine the role that museums should play and the factors that support their activities. This work depicts concrete organisms suddenly forcing their way into a familiar urban landscape filled with high-rise buildings. They must have originally been intended as spaces for human beings to live and carry out their daily activities, but now the organisms are gradually dividing and proliferating, and turning into twisted organic bodies that move around.